I love PTO. However, jungles do not present decent tank country. Too much time spent in the PTO as a newbie can result in lopsided development that is short on armoured fighting vehicle (AFV) experience. 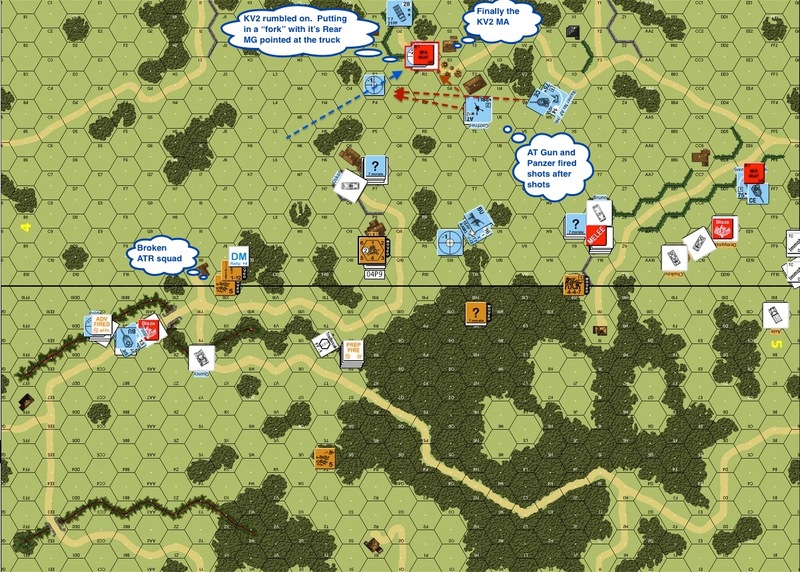 This scenario took place near Borisov (Russia), mid-1941 – the opening stages of Barbarossa. Elements of the 1st Moscow Motor Rifle Division was sent to block the spearhead that was Guderian’s 18th Panzer Divison. North is on the right of the map. The Germans deployed on the top map (west) and the Russians came in from the bottom (east). 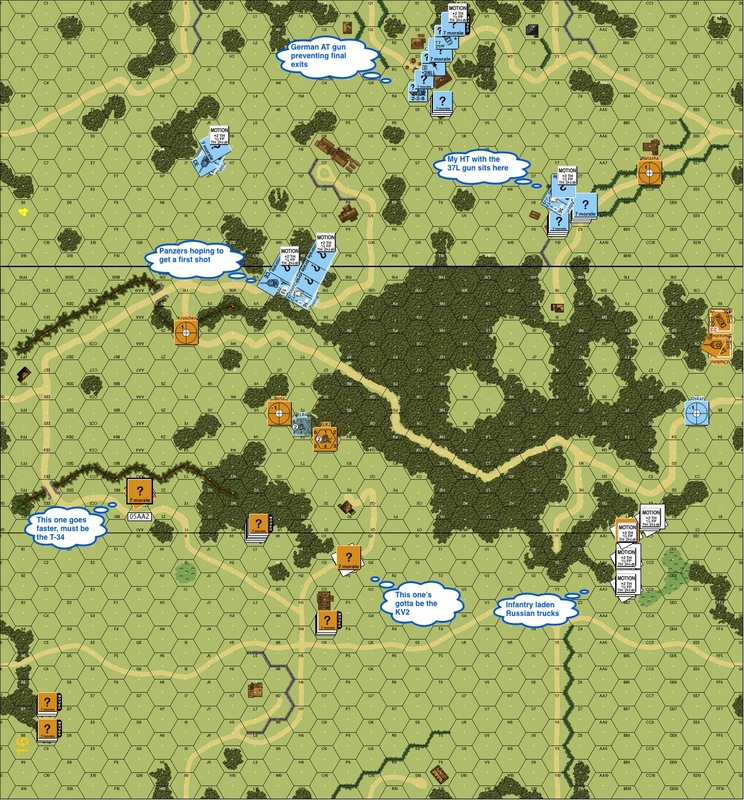 The Russians win when they exit more than 15 victory points (VPs) off the top edge of the map between the road on the top middle to the road on the top right. The other way to win was to kill enough Germans. The KV2 was worth 7 VPs, the T-34 was also worth 7 points and each squad was worth 2 points. As you already know, the Russians had a KV2, a T34 M40 and a couple of BT7s. The Germans had a couple of PzIIIGs, a halftrack sporting a 37mm gun with a high rate of fire (I forgot about the ATR that it also carried) and a couple of halftracks with the usual machine guns. They were backed by a 28mm antitank gun and further reinforced by a pair of PzIVEs in Turn 4. The above was the German Turn 2. You can see the two Panzers on the left lying in wait and hoping to get a first shot at the Russians. The antitank gun was towed to a clump of woods near the exit for a last-ditch defence. The half track with the 37mm gun was on the right and they could hear the speedy BT7s and a convoy of trucks rumbling towards them. This was the Russian Turn 3. 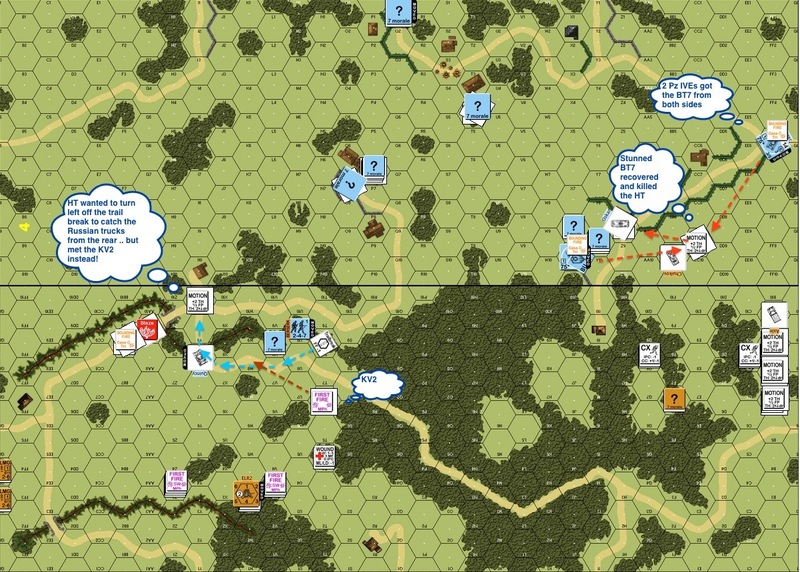 The T34 came up the left and the PzIIIG fired, looking to scoot behind the woods quickly afterwards. I rolled a 1,1 .. and a 1. Critical Hit!! 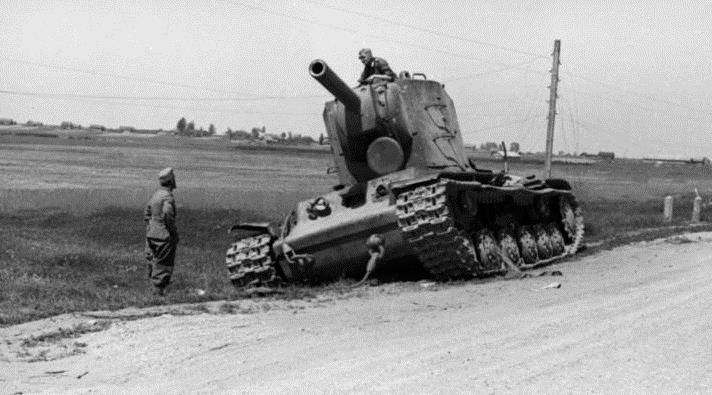 The T34 exploded into a burning wreck, and the German tankers sat stunned as bits of Russian tank rained down. On the right, the 37mm gun pumped shot after shot into one of the BT7 and killed it. This was the German Turn 3. I am very inexperienced in tank warfare so you won’t see an end to idiotic moves in the near term. This was one of them. I backed a PzIIIG up over the bridge on the left in the hope of being able to get away faster when the Russian tanks appear. Not only did I presented my rear facing to the Russians, I forgot to button up. The tank was immediately stunned by infantry fire and then killed by a Russian antitank rifle (ATR). Things worked out better on the right as my 37mm gun shocked the other BT7. This was the German Turn 4. To the left you can see another one of my moments. 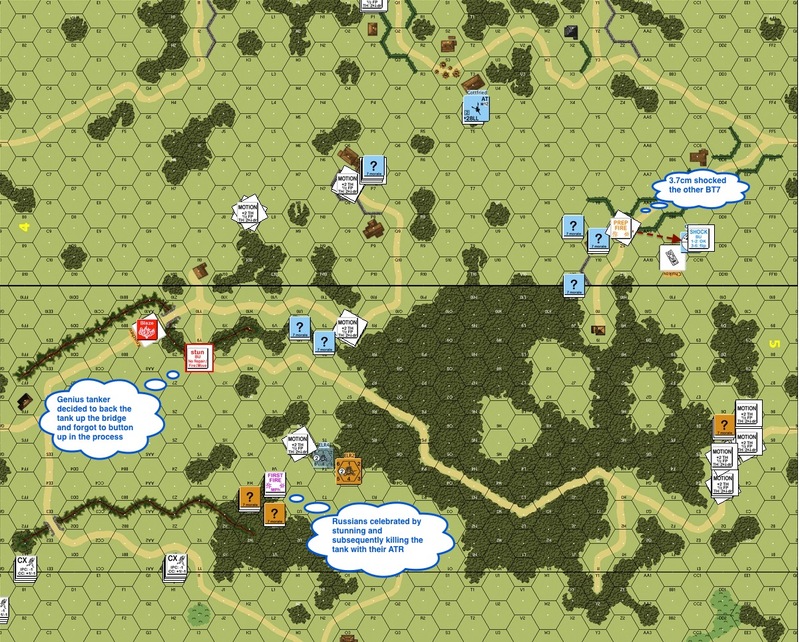 The Germans were hoping to crash a halftrack through the woods on the left, get back on the road and circle around the back of the Russian trucks on the right. However, they realised that trail breaking took a little time and by the time the half track emerged from the woods, it was looking down the barrel of a KV2! So instead of breaking to the right of the map, they sped towards the left to escape. The KV2 fired but the halftrack speed and its size saved it. The surviving BT7 recovered from its shock and killed the gun-toting halftrack. Unfortunately the reinforcing PzIVEs arrived and got it bracketed from two directions. This was Russian turn 5. Our escaping halftrack on the left had a Russian ATR squad on its tail. The KV2 on the other hand laughed and used the trail-break created by the charitable halftrack to get to the “inside line” of the Germans. The BT7 blew out its gun in a shootout with the PzIVe on its left (which also malf’d its gun) and was killed by the PzIVe on its right. The right PzIVe proceeded to shoot up the Russian trucks one by one. During German turn 5, one of the German half squad had a berserk moment. They got tired of the shooting and concluded that the proper thing to do was to charge the Russian medium machine gun. So off they went. They ran through Defensive First Fire, then Subsequent First Fire … jumping into the MMG nest, they survived Final Protective Fire!! “.. and THIS is how it’s done! !” they yelled. Meanwhile, Katya, the peasant girl sniper rolled her eyes, spat and muttered “Men” before shooting up the marauding German half squad and ended the lunacy. This was Russian Turn 6. 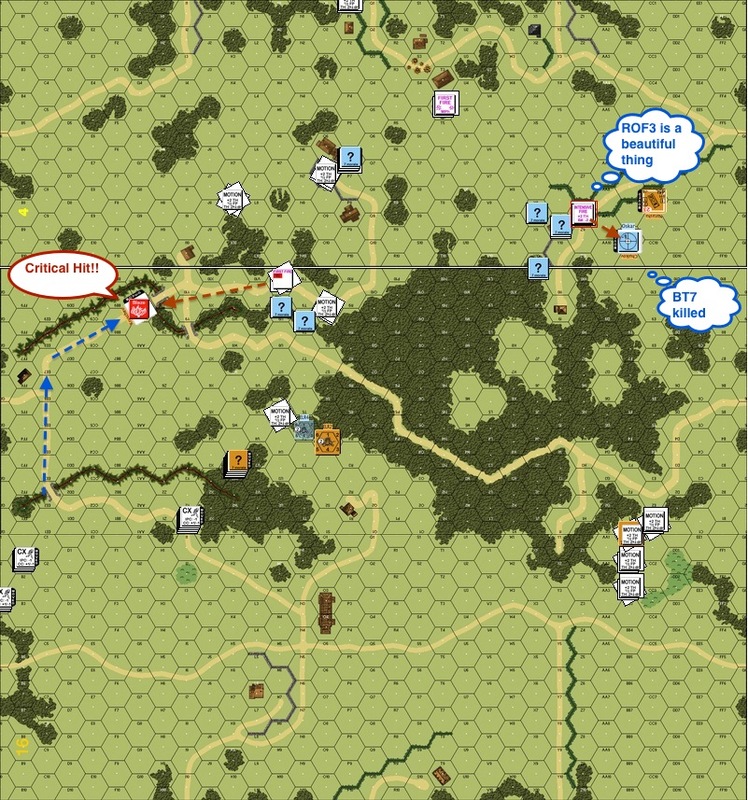 During the last German turn, the only Panzer with a functioning gun sped into its final position while its colleague proceeded to kill all the Russian trucks with its MGs on the right of the map. However, the KV2 killed the halftrack that tried to escape from in front of the wooden house. The escaping halftrack to the left survived another shot from the Russian ATR and ran. The KV2 crew watch incredulously as the crazy halftrack ran across its covered arc. Then it realised that KV2 can’t intensive fire. The halftrack disappeared behind some woods. In this turn, the KV2 followed. I can only imagine the commotion on the halftrack as the KV2 reappeared on its “rear view mirrors”. This was Russian Turn 7. The mighty KV2 lumbered towards the goal line. The PzIVE and the antitank gun bounced shot after shot off its front armour. The KV2 went to a “fork” position, threatening the German truck with its rear MGs while shooting back at the antitank gun with high explosives from its terrifying “bunker busting” 152mm gun. 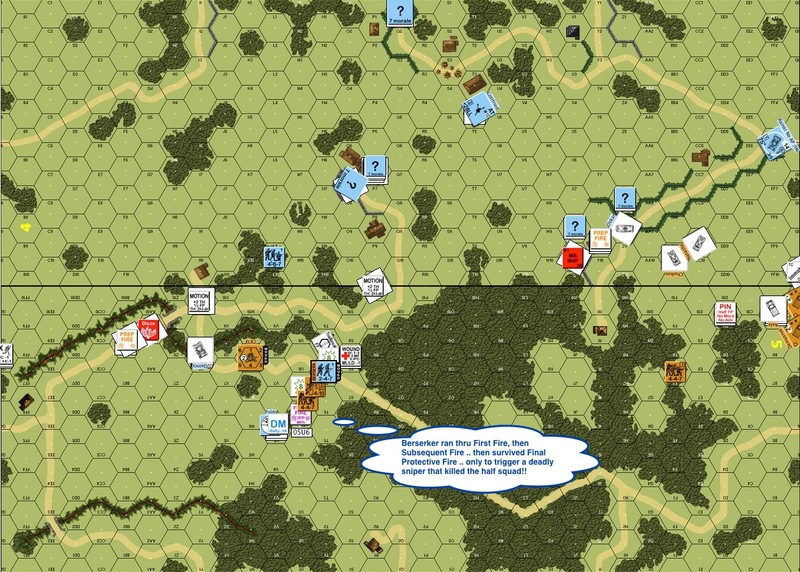 The antitank gun crew worked as fast as they could, dreading the massive fireball that the next moment must bring. Then for a moment, there was silence – the 152mm gun malfunctioned. 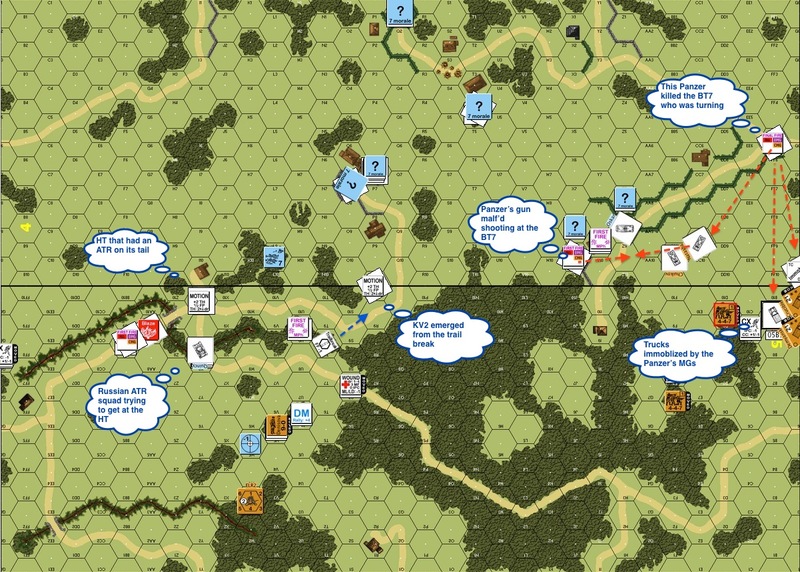 This entry was posted in Game Play and tagged AAR, Advanced Squad Leader, AFV, ASL, Board Game, board wargame, Hong Kong, Multi-Man Publishing, Scenario, tank, VASL, wargame. Bookmark the permalink. Tank’s got to love them. It does take a lot to get used to them and get the best out of them. It’s always essential to know where your going with them and that you can get there in the turn you plan to do it. Ian – this is definitely another learning curve to get up on .. and then of course there is the ability to use combined arms effectively!! Appreciate the advise. Excellent AAR! I always look forward to your posts! I appreciate your kind comments Jack! Great AAR. Keep em comming. I appreciate the kind comments!! Nice AAR and sounds fun as well. Got a lot of those little ‘personal’ incidents that make the game stand out in the memory as well. I just read ‘Blood Red Snow’ recently and this game sounded similar to some of the stuff that went on there. I guess my actions reflected how frantic the Germans might had been when they found themselves out classed and out gunned the first time by Russian armor! I think I have the translated (Chinese) version of “Blood Red Snow” – like it?